Are we there yet? Soon. Are we there now? It’s going to take longer than that. Is that now? No, later. When is later? We’ll be there in two hours. How long is 2 hours? 120 minutes. Did we wait long enough? No, in two hours. How long is two hours? 4 Dora the Explorers, or 1 showing of Frozen plus a little bit, or two services at a Lutheran church or one at a Baptist. So now? How about now? Are we there yet? How about now? You told me we’d be there soon! Verse 6 begins, “So when they had come together, they asked him, “Lord, is this the time when you will restore the kingdom to Israel?” Now? Is it now? Is this the time that you promised? Like small children whose little mush brains can’t yet understand the difference between now and two weeks from now, the disciples ask now? How about now? Is it now? We’ve heard the disciples ask this before- is now the time you will restore the kingdom to Israel? Not now, Jesus says. Later or Soon. Doesn’t really matter. In verse 7 He replied, “It is not for you to know the times or periods that the Father has set by his own authority. The disciples ask Jesus a question about when, but he answers a question about how. In verse 8, Jesus says “But you will receive power when the Holy Spirit has come upon you.” Not yet, but soon. Jesus promises them that they will be witnesses to the whole world, but starting first right where they are in Jerusalem. Today is a change of seasons. We’ve basked in the glow of the resurrected Christ in Eastertide. We’ve just celebrated the 40 days of Easter. Next Sunday, we’ll join with Christians around the world to celebrate Pentecost and the giving of the Holy Spirit. This past Thursday was the Ascension- when we read this text about Jesus rising up, leaving the disciples in body but promising the Holy Spirit. We tend to talk about Pentecost as the birthing of the Church. But maybe we’re a bit pre-mature. Maybe Jesus’ departure is what prods us to begin as Church. Ascension holds a funny place in our spiritual lives. Our creeds make sure to mention it and early Christians seemed to think it important: On the third day he rose again, in accordance with the Scriptures; he ascended into heaven and is seated at the right hand of the Father. In some churches, if you lit the Pascal Candle on Easter, you extinguish it on the Ascension. But we don’t have a ton of traditions built up around it. There’s not Ascension Day release of balloons, or flying of kites. There’s no Ascension Day pageant where we dress up in white robes. No Ascension Day gifts or traditional meringue cookies and angel food cake. Not much of communal practice of hiking up a mountain. It’s a weird holiday, a time to celebrate when Jesus leaves us and before the Holy Spirit shows up? A time left where we may feel, well bereft. No wonder the disciples are left staring up at the sky, asking what the? But now, right now, on Ascension, we are in between. The problem with being in between is that it’s an uncomfortable place, an unstable place. It could be good, it could be tense, because we just don’t know what comes next. We are in the waiting. You know this waiting. You live in this in-between too. Waiting for the grade, the acceptance letter, the rejection letter, the biopsy results. Waiting to be fired when you know it’s coming. Waiting for a baby to be born. Waiting to be old enough to do that next big thing, waiting to die. Waiting in to see if the money comes in. Waiting to find out what will happen to us. After Jesus gave them the promise of the Holy Spirit, Verse 9 says “When he had said this, as they were watching, he was lifted up, and a cloud took him out of their sight. 10 While he was going and they were gazing up toward heaven, suddenly two men in white robes stood by them. 11 They said, “Men of Galilee, why do you stand looking up toward heaven?” We can understand why their eyes are fixed on the sky where Jesus just ascended; it’s kind of a ridiculous scene. But the disciples get caught in a sort of spiritual rubbernecking, keeping their eyes on what just happened and not where they’re supposed to be going back to Jerusalem. You who travel on the Mass Pike, or Route 9 know this temptation- something going on in the other lane that catches your eye. Ruber-necking is what happens when you are going one way and your eyes are looking back. The disciples get caught looking up when they’re supposed to be heading out. Jesus could have gone up, and the Holy Sprit could have come down, a sort of Trinitiarian cosmic elevator swap or tag-team handoff. But that’s not what happens. “To use the language of the theologian Lieven Boeve, the ascension “interrupts” the story, and prevents closure.” There’s an interruption. There’s a pause. A break. A lacuna. A breath in-between the words. We are in the space between. In music composition, a lacuna is the negative space in between the music, an intentional pause that creates both peace and tension at the same time. We don’t know how long that lacuna will last, but we know something more will come. Look at the disciples as they return home to Jerusalem in verse 12. The lacuna isn’t devoid of action, but preparatory. They devote themselves to prayer. They are getting nimble, getting ready for the unknown next. The Ascension is where God’s people wait and learn to be responsive. If we let it, the Ascension teaches us to be expectant, not anxious. To be agile, nimble- not exactly words I often think of when I think of church. Ascension invites us to be ready to go where the Spirit sends us next, to stop staring at the soles of Jesus’ feet ascending into heaven and be Christ’s hands and feet ourselves. The promise is big- you will be my witness to the ends of the earth! But let’s start first back at home in Jerusalem. First go home and prepare. Go home and wait. Go home and pray. Church, I think you feel this lacuna. We are inbetween. You are inbetween. We are somewhere between the time when Church was a given in people’s lives and whatever will come next. We are between what is, and what will come. 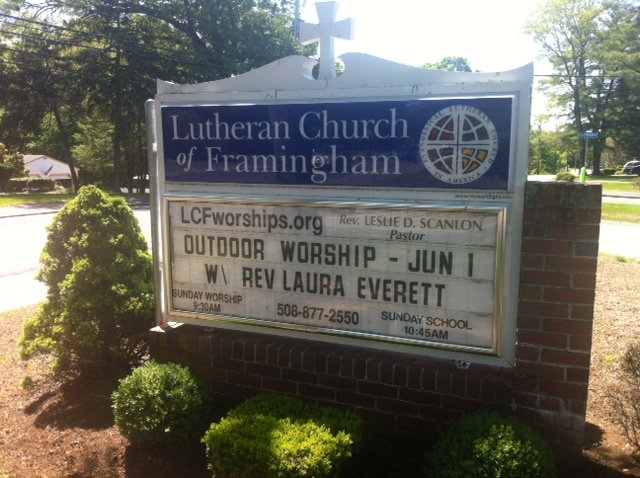 And our God has not abandoned the Church universal, or abandoned the Lutheran Church of Framingham. Now, I’m not a runner and in no danger of outrunning anyone. And as much as I love the Church, the Church is rarely an early adapter. We’re not often in danger of moving too quickly. If anything, the Church is often in danger of moving too slowly! But we can be impatient. We can confuse action for wisdom. We can confuse frenetic, anxious movement for faithfulness. We can get our eyes fixed on what’s above us, or behind us, and forget that God goes before us. The Ascension teaches us expectant waiting, holy preparation. One day, being under a strong exercise of spirit, I stood up and said some words in a meeting; but not keeping close to the divine opening, I said more than was required of me. Being soon sensible of my error, I was afflicted in mind some weeks, without any light or comfort, even to that degree that I could not take satisfaction in anything. I remembered God and was troubled, and in the depth of my distress He had pity upon me, and sent the Comforter. I then felt forgiveness for my offence; my mind became calm and quiet, and I was truly thankful to my gracious Redeemer for His mercies. About six weeks after this, feeling the spring of divine love opened and a concern to speak, I said a few words in a meeting, in which I found peace. Being thus humbled and disciplined under the cross, my understanding became more strengthened to distinguish the pure Spirit which inwardly moves upon the heart, and which taught me to wait in silence sometimes many weeks together, until I felt that rise which prepares the creature to stand like a trumpet, through which the Lord speaks to His flock. May it be so for us, Amen. * massive hat tip to my Quaker friends on Facebook and Twitter who helped me with the idea of “outrunning one’s guide.” Thanks!